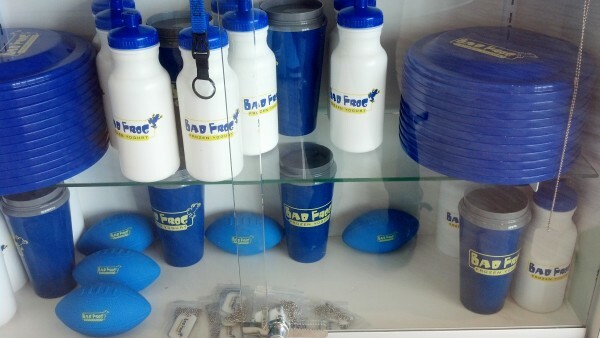 Printed Promotional Products. Ideas for Promotiong your business. Promotional Products are a great way to get your logo out into the world and into the hands of the consumer. Think of items people use everyday and imagine your logo incorporated in their a daily routine. There are thousands of fun, usable products that Signco can print for you to give to your employees and customers. Some examples we have done in the past are: Printed Pet Scoopers for Dr. Hill of Pet Care Animal Hospital Tervis Tumblers for Carstar's Annual Golf Outting Dart Click Pens for Bill Mitchell-Attorney At Law Pill Shaped USB drives for Dr. Sachin Patel of the Living Proof Institute including his own personal cookbook Doggie Bandanas for a fund raiser at Trinity Pub in West Chester, Ohio 24oz Tumblers for the Madeira Car Show Dog Tags, Rubber Footballs and more for Bad Frog Frozen Yogurt Printed Coasters for Humphries Mortgage Company Printed koozies for wedding gifts, Family Game Nights, Golf Outtings and more! That is only naming a few so if there is anything we can suggest or help you find, Signco will be happy to guide you through the limitless possibilities of promotional products. Things to remember: The average person has at least 5-8 promotional mugs in their home and a printed T-Shirt is usually kept for 4 years or more!